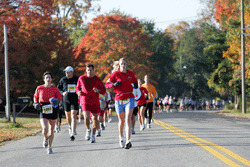 Screech, Sit Down and Olab completed the Fall 26.2 mile race. 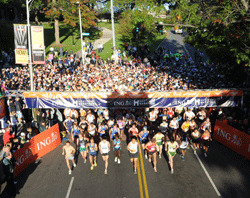 Nearly 7,400 runners crossed the finish ilne at the ING Hartford Marathon on October 10, 2009 - thousands of spectators cheered as the 1,000 5K runners came under the Arch, followed by over 4,000 Half Marathon runners and 2,300 Full Marathon runners. Actually, it was really all good ....only the 26.2 was bad and ugly! Despite some rain off and on, it was a really nice drive up to Hartford on Friday. 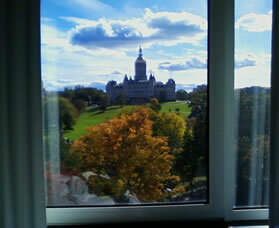 We arrived at our hotel, went up to our room and the view was beautiful! 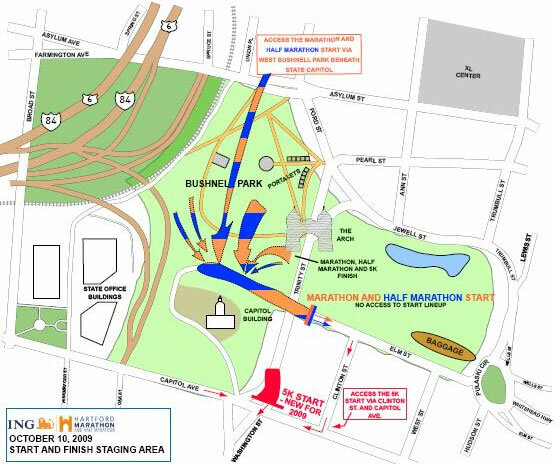 It was a lovely view of the capitol building located at Bushnell Park - also the start/finish of the marathon. 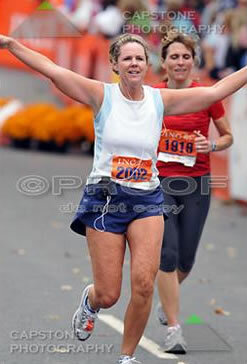 It was really great being, literally, across the street from the start/finish of the marathon. SEE PHOTO ABOVE! We walked to the Expo ( a mere 2 blocks from our hotel!) and it was so cool to see Barbara and Tony with their "Made 4 Medals" booth as soon as we went in! The Expo was small but nice~ easy to get around and plenty of volunteers so no long lines for anything. We got AWESOME shirts!! I did pay for the upgraded shirts and it was well worth it. Navy Blue/ Orange long sleeve tech shirts ~ definitely the nicest marathon shirt I've seen :-). Cool race bags too..they are made of some sort of recyclable material (Hartford is touted as a "green" marathon). We walked back to the hotel and rested up a bit before meeting for dinner. Jack's sister, Amy lives in Hartford so she picked the restaurant and we all met up for dinner. Again, close enough that we were able to walk to restaurant! Besides Amy & Steve (her boyfriend), myself and Rich, Wes and "Mu" met up with us as well and we had a great pre-race dinner. Amy needed to carb up too as she was running the 1/2 and Steve was doing the 5K (in hindsight, Steve had the right idea!!). And by the way, the city of Hartford is really, really nice ~ tons of restaurants, brew pubs, and cool shops~! 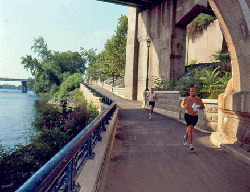 Marathon morning, up early to log on and check the weather.....90% humidity and 61 degrees at 5:00 AM~~ Yikes!!! Well, at least it was easy to determine if you needed throw aways or not (NOT!). Eating breakfast by 5:30 and had loads of time to hang out before walking over to the start. Plenty of portalets (yup...apparently in Ct, there's no such thing as a port-a-port, it's a portalet!!) and lines were not bad AT ALL - now given that we literally were across the street, ya wouldn't think I'd be visiting the ole portalets - but, well.....I just had to check them out :-). So...(ok...it's coming "the bad and the ugly part"). Rich and I walk to the start line (yes, he did not disappear - we hung out the whole time pre marathon) and I went to the 4:15 pace group sign. Well, folks, it was a 4:15 sign - yup - no actual pace leader - just the sign (and that ladies and gentleman should have been my SIGN (omen or whatever you want to call it!). Besides singing the National Anthem, we had an invocation - which I thought was very nice - a first time I have heard that. For supposedly, 10,000 people (1/2 and full started together) it was only a few minutes after I crossed the start line from the initial gun start. Oh, and the pace leader did not show up - but guess who did - oh, yeah..Mr. Sun!! Ugh... And don't ask me why the sun & humidity bothered me so much when we trained all summer in the heat - but somehow this was different. It was pretty crowded running at first and the sun seemed especially hot (??) and I was asking if the course had shady part before I hit mile 1 - so I was getting concerned early. 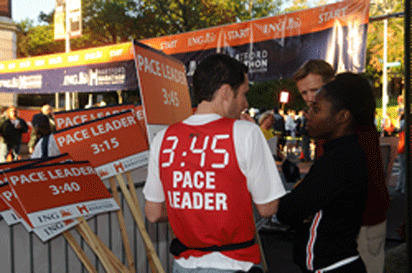 Ok...because we didn't have a pace leader, I stayed w/ two girls who were standing at the 4:15 sign too. One had a GPS watch and was announcing our times, 9:00/ mile, 8:50/mile....I'm like..hmm....uh.....I can't keep doing this. But, I hung w/ them until Mile 5 or so and actually felt OK but knew it wasn't smart to stay w/ them ~ and I was stopping for water each time and they weren't so I had to run to catch back up w/ them each time. 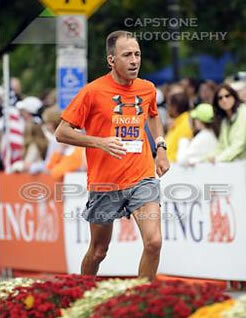 After mile 5, I slowed down to where I thought was a reasonable pace to finish out the race. I saw Rich around mile 9 for me and probably 11/12 for him. I was looking for him in his bright yellow Pike Creek Jersey - but he was shirtless (yeh..it was a tad warm) but I did see him and yelled and he just looked up, frowned and put his thumbs down~I laughed and said "me too". I knew that early, that it must might be a struggle for me. I could hardly wait until 13.1 but also knew when I got to that point that if it was tough to reach the 13.1 mark, 26.2 was probably not going to be a "cake walk". I can't tell you what went wrong but it did. I kept telling myself, you had great training runs, this is NO different, and would re-adjust, in my head, my "finish time". Well, I can tell you, at some point, I'm like, I don't care when I finish, I just want to FINISH. I was holding off using my iPod until Mile 20 thinking I would only need a bit of music for the last 6...cripe..I needed a bit of everything and anything for the last 13! I put my iPod on at mile 19 and just tried to get from water stop to water stop. The course, which was flat for the most part and went thru some very pretty areas, had some hills, the last 10K or so -which, if I hadn't felt so bad, wouldn't have been so bad -but as I was approaching them, I was like UGH. Ok..the bad and ugly parts are done. Now, I have to tell you, this was a great marathon actually! There were SO many volunteers at each and every stop. Not only did they give out gu's at the designated stops, but volunteers were riding along on bikes giving out gu's to the runners!! How nice is that?! It was extremely well organized and I would highly recommend it~. It was nice to just walk a few minutes to our hotel, shower and change and then walk a few blocks up to this brewery for beer and burgers! !